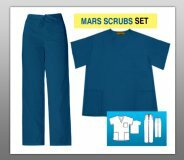 The sets include a v-neck top and pant. The top has 2 deep patch pockets, set in sleeves and side slits. Pants feature a drawstring and back elastic waist. Includes a back hip pocket. Semi-flared cut. Sizes include SX to 3XL. Please note that sizes run large. Refer to the size chart for your perfect fit.